Catherine Rogers Arthur, left, and Bill Leslie, right, meet with their class twice a week in the wine cellar of Homewood House. The students are researching an exhibit on early American pets that will open in the museum in January. Editor's note: This is part of an occasional series in which reporters drop in on interesting classes throughout the university's eight academic divisions. Suggestions are welcome at gazette@jhu.edu. The course: Offered by the Museums and Society Program and the Department of History of Science and Technology, both in the Krieger School of Arts and Sciences. The semester's work for the 10 students is worth 3 credits and includes a unique hands-on experience: Their course work will culminate in an exhibition titled Feathers, Fins and Fur: The Pet in Early Maryland, which will open to the public on Jan. 4 at Homewood House Museum. The course represents the essence of the newly created interdisciplinary Museums and Society Program, which offers undergraduates significant opportunities to establish meaningful connections with local and regional museums. Meeting time: Thursdays and Fridays from 10:30 a.m. to noon, fall 2006. The instructors: Jointly teaching the course are Catherine Rogers Arthur, curator of Homewood House, and Stuart "Bill" Leslie, a professor in the Department of History of Science and Technology. Arthur holds a master's degree in early American culture from the University of Delaware Winterthur Program and is co-author of Homewood House (JHU Press, 2004). Leslie, who specializes in the history of technology, history of science-based industry and regional economic geography, also earned his degree from the University of Delaware, a doctorate through its Hagley Program in industrial history. His current book project, "We Can't Make It Here Anymore: A Road Trip Through Deindustrial America," includes industrial museums as important stops on its itinerary. Syllabus and course work: Dogs, cats, birds, fish and even potbellied pigs are pampered members of the 21st-century American family. But exactly when did we first invite them into our homes? Back when the Homewood campus was a homestead, what animals were properly kept as pets? Where was the line drawn between companion animals and livestock? Did 19th-century pets have responsibilities like catching mice to earn their keep? This course seeks to answer all those questions and more. Homewood House provides the framework for introducing students to the concepts and ideology of material culture studies, or "reading" objects. 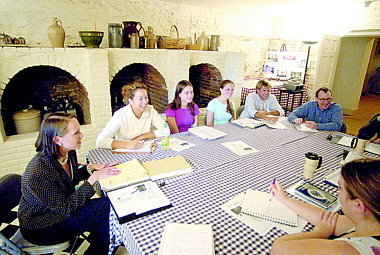 The class is learning the practical application of these methods by researching original late-18th- and early-19th-century sources for evidence of the nonhuman family members and livestock that were part of the scenery, especially as they relate to Homewood, the 1801 country house of the Carroll family. Students gather in the historic house's quaint wine cellar, where they sit side by side with their teachers around a table decked with checked gingham cloths — a pleasant change of pace from the typical academic classroom's chair/desk combo. Thursday classes are devoted to lecture, discussion and brainstorming. Instead of assigned readings, students are asked to spend two hours each week actively engaged in original research using primary sources so they will become experts in their topics. Friday classes are for research, exhibition planning, object and image selection, and field trips, including a recent visit to what is believed to be Charles Carroll's hunting lodge. However, the overarching assignment for students is to produce the exhibition, the object labels and the catalog. Catherine Rogers Arthur says: "Changing exhibitions have been a priority over the past 10 years. Exhibitions help us to attract visitors, generate publicity and allow us to provide content footnotes to the primary story of the house and the people who lived here. More importantly, the exhibitions expand our knowledge of early-19th-century local history and keep us actively engaged in research, in keeping with the research mission of the university. With this class, I now have 10 research assistants, and the investigation and production of an exhibition have become tools for teaching. It is exciting work with the students, and I eagerly anticipate each class to hear about their research finds and their creative ideas for installation and interpretation." Bill Leslie says: "I'm strictly an enthusiastic amateur when it comes to museums. For me, the course is an opportunity to see the museum from the inside out, to learn firsthand what it takes to research and mount an exhibit. I've learned a great deal already, from Catherine and from the students. Indeed, the class has inspired me to teach a new course on science and technology museums, where I know more about the subject." A student says: "I'm a senior in the class and very much enjoying it. I first chose it because it is cross-listed with Women, Gender and Sexuality, which is my minor. I'm an art history major, so the idea of putting on our own exhibit was especially interesting to me, and the fact that I love pets was just an added perk. Bill and Catherine are wonderful and enthusiastic professors who are creative in their exploration of the subject matter and presentation to us, as a class. The fact that we are researching and discovering alongside our professors is unusual and keeps me truly engaged and attentive. Catherine especially is invested in this project as it reflects very heavily on her, and her trust in us as key players in the exhibit's execution is truly gratifying. We are also presented with such unique opportunities to visit private homes, collections, behind-the-scenes tours, etc., that our research ends up being just as fun as our presentation to the class and brainstorming sessions. Catherine and Bill seem truly excited to be participating in such a unique class, and their interest in our educational growth extends beyond the scope of this course and exhibit. They regularly present us with opportunities to further explore Baltimore culture for our own enjoyment and intellectual curiosity. I'm having a wonderful time in this course and can't wait to have a finished product to show everyone that the 'pets class' isn't a joke just because it's fun." — Laura Lee Carrihill, a pre-med senior with a major in art history and a minor in Women, Gender and Sexuality, Manhasset, N.Y.
GO TO OCTOBER 23, 2006 TABLE OF CONTENTS.